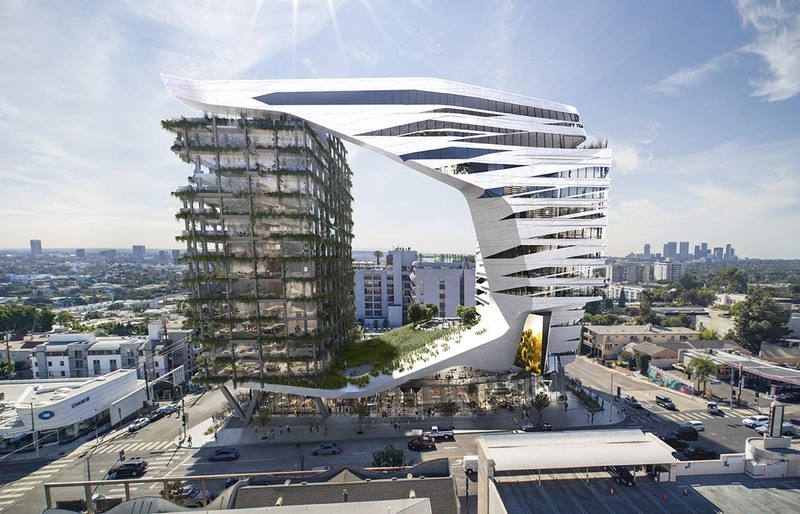 The Viper Room, the legendary Los Angeles nightclub cofounded by Johnny Depp (and where River Phoenix overdosed) is set to get an architecturally ambitious replacement courtesy of Morphosis Architects. After developer Silver Creek Development Co. picked up the parcel in West Hollywood for $80 million in July of this year, it was announced that a 15-story hotel would go up on the site. Last week the public was given its first look at the replacement, which features a vise-like volume “clamping” down on a more traditional, loggia-adorned tower. The proposal also sports glassy ground-level retail bordered by V-shaped concrete columns. The 200-foot-tall hotel will feature 115 hotel rooms, 31 condo units, 10 affordable units, a gym, a spa, restaurants, a pool, and a new home for the Viper Room. It’s somewhat hard to see in the rendering, but the developer wants to include an 820-square-foot digital billboard on the Sunset Boulevard–facing facade. The project’s initial reveal came at a community meeting on December 11, where Silver Creek sought to solicit community feedback and refine the design. The hotel will move next to the West Hollywood Planning Commission’s Design Review Subcommittee, and then the Planning Commission proper. No construction timeline has been given as of yet.